NEW Attachments, LOTS of Power, GREAT Prices! 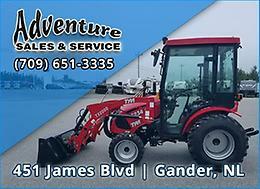 TYM Tractors at Adventure Sales! TYM Tractors! Get more for less! EXCLUSIVELY at Adventure Sales & Service in Gander and All Star Recreation in Lewisporte. TYM has been producing quality tractors for over 60 years, building tractors from 19HP to 105HP and a wide range of implements to compliment them! T194HST What makes the T194 right for the job? Well for starters it's: * Powered by a 19HP Yanmar Tier 4 Diesel engine * 2 Range HST (hydro static transmission) * 4WD with locking rear differential * 3 Point Hitch with 1,100 lb lift capacity * 617 lb loader lift capacity * One-touch PTO on/off switch * Rear PTO * Mid PTO * Low vibration/noise flat deck * Spacious operators platform * NEW BY50 Backhoe for the T194HST Tractor: * Digging depth: 71.4" * Loading height: 54.1" * Bucket cylinder digging: 2050 lbs * Dipperstick cylinder digging force: 1256 lbs * Standard 12" bucket * As shown here, this Tractor, Mower, Loader and Backhoe is $23,999 + HST OR just $94 bi-weekly * Get all of this PLUS a Snowblower attachment for only $26,899 or $105 bi-weekly (YES -just $11 more!!) Want to learn more about the T194 and what makes it the perfect tractor for you? Just call us at709-651-3335 in Gander or 709-535-2242 in Lewisporte. Or visit us online at ! T234HST More power means more work in less time and we all love that! * 24.4 Gross HP Mitsubishi Tier 4 engine * 3 point hitch with 1,534 lb lift capacity * 1,380 lb loader lift capacity * Hydro static transmission * 4WD with locking rear differential * Heavy duty front axle with bevel gear * Hydraulic power steering * Rear PTO * Cab with heater * Optional backhoe attachment * Includes block heater * Includes rear remote valve * Available with optional ROPES * This Tractor with Loader and Heated Cab is only $27,699 + HST OR just $108 bi-weekly tax included Where can you get this tractor? Adventure Sales & Service in Gander or at All Star Recreation in Lewisporte! T394HST! More fun per acre than any machine in it's class! It might be a subcompact utility tractor, but don't tell the T394HST! It's got lots of power! * Lots of power in the 37.4 Gross HP Yanmar Tier 4 diesel engine! * 3 point hitch with 2,646 lb lift capacity! * 2,235 lb loader lift capacity! * Robust front axles and power steering * Hydro static transmission * 4WD with locking rear differential * Heated and air conditioned cabin * Backhoe attachment * Includes block heater * Includes double rear remote valves * AM/FM Bluetooth stereo (on cab models) * This Tractor with Loader, Backhoe and Heated & A/C Cab is only $45,998 + HST OR just $177 bi-weekly tax in T554HST * 55.1 Gross HP Yanmar turbo diesel Tier 4 engine! * 3 point hitch with 3,314 lb lift capacity! * 2,478 lb loader lift capacity! * Hydro static transmission * 4WD with locking rear differential * Hydraulic power steering * Rear PTO with 42.2 HP * Optional heated and air conditioned cab * Optional backhoe attachment * Includes block heater * Includes double rear remote valve * AM/FM Bluetooth stereo * This Tractor, Loader and Heated & A/C Cab is $46,999 + HST OR just $181 bi-weekly tax included At Adventure Sales we understand that winter is not optional!! That's why block heaters are standard on all of our TYM Tractors! For over 6 decades, TYM has been entrenched in the global agricultural marketplace. Our experience has honed our expertise, enabling us to build tractors at the utmost level of quality. In 2004, we introduced the first line of compact tractors into the western region of the United States. Customers quickly recognized the quality and value of our machines. This success prompted us to expand distribution into the eastern U.S. as well as Canada. Our superior tractors are manufactured in Seoul, South Korea and then assembled in Wilson, North Carolina. If you're on the search for high-performing models within the 19 - 105 horsepower range, TYM Tractors will work HARDER and last LONGER than anything else out there. We make it easy to get into a tractor here at Adventure Sales & Service and All Star Recreation with our outstanding FINANCING options! Call or drop in to see us at 451 James Blvd in Gander or 418A Main Street West in Lewisporte. We'll explainjust how easy it is to purchase a brand new TYM Tractor. If you live outside of Gander or Lewisporte or just can't make it in, no problem - just give us a call at 709-651-3335 or 709-535-2242 . Note that all bi-weekly payments are based on a 240 month term, unless otherwise stated. Beautiful Two Bedroom near Quidi Vidi! LIMITED TIME OFFER! Until MARCH 31, 2019 - 50% Security Deposits! Want to live in an incredible 2 bedroom apartment complete with: - Granite counter-tops - In-suite washer and dryer - Ceramic and wood flooring - Open concept kitchen with peninsula bar - Glass balcony - 100% Smoke free 2 Bedroom Units starting at $1425.00 POU This stunning building offers a grand foyer equipped with elevator, a relaxing residents lounge with a kitchen, plus a fully equipped fitness room! Just minutes from: - Quidi Vidi Lake Trail - Rennies River walking Trail - Signal Hill - Downtown Shopping and Restaurants - Supermarkets Location! Location! Location! Email chelseaplace.nl.classifieds.killam@aptleasing.info or call us Toll Free (833) 429 6419. Please note the nightly rate quoted is in US dollars This beautiful villa is our home away from home and can be yours too! We offer a bright, clean & spacious vacation getaway in a fantastic location. Our villa has four bedrooms and three baths. There are two master suites each with queen beds, private ensuite and pool access. There are also two bedrooms furnished with two twin beds. Our villa can sleep eight comfortably. Though we are near multiple restaurants & fast food, the kitchen is fully equipped if you wish to cook and a bbq is also provided on our pool deck. Our pool is very private and it offers a large deck for sun bathing. However, the hot tub is not available with the rental. There is also a covered lanai for relaxing in the shade during the day or entertaining at night. We also provide complimentary wireless internet and long distance calling to Canada. Our villa is in the quiet, gated community of Magic Landings nestled off Highway 192 in Kissimmee. The location is great if you are a shopper as there is also easy access to stores and the Prime Outlets are 20 min away in Orlando. There are also many restaurants nearby and we are 20 minutes from the Orlando airport and all your favorite Florida attractions & theme parks such as Disney, Universal Studios, etc. Please note this vacation villa is not available for Easter break. Our villa features include: * Private & screened pool * Pool chairs & loungers; * Pool exit doors are equipped with safety alarms; * Fully air conditioned; * No carpet- all ceramic flooring; * Quality furnishings; * Towels, linens & pool towels; * Washer & Dryer; * Hair dryer in each bath; * TVs in each bedroom; DVD players in twin rooms; * Child playpen & bedding; * First Aid Kit; Please contact us for more information on rates & availability. Tuscana is a luxurious Mediterranean-style villa resort located in the heart of Orlando Florida’s best attractions Disney World®, Universal Studios®, SeaWorld®, LEGOLAND® and amazing Golf Courses. From the minute guests arrive at Tuscana, they will experience the magic of this special resort which is beautifully landscaped with lush planting and a private woodland. Accommodation consists of a 3 bedroom spacious condo with a large balcony. The condo is fully furnished with everything you will need for your stay. It has a fully equipped kitchen, dining area, 3 Flat Screen TV’s , screened porch, air conditioning, washer and dryer and 2 full bathrooms. Tuscana resort is equipped with all the amenities to ensure an enjoyable stay; a large swimming pool complex with separate kiddie’s pool, hot tub, 30 seater cinema, a fitness centre, snack bar, restaurant, tavern bar, BBQ areas, picnic tables, free WI-FI and spa services. The resort is safe and secured in a secure gated complex with free ample parking facilities. The condo has comfortable furnishings, with all new living area furniture and Sealy sofa bed, Magic Jack free North America long distance calling, WII system for the kids, Blue Ray player and sleeps up to 8 people. Florida Vacation Condo – 10 Mins from Disney 3BDRM 2BTHRM Top Floor 3 Bedroom, 2 Bathroom Condo Unit 4408 – Tuscana Resort This spacious 3 bedroom and 2 bathroom condo is on the top floor (Less Noise) of building 4 (Unit 4408) at Tuscana Resort overlooking a conservation area. A luxurious villa resort located in Orlando (Champion’s Gate – Just off the I4) about 10 Minutes from Disney, and 30-45 Minutes to Universal Studio’s, Sea world and Lego Land. Building 4 is located very close to the pool/bar and main clubhouse. At our unit you have the Piece of Mind of ON-SITE Management and Maintenance. You check in just like a hotel. Tuscana is a self-catering resort so when you stay you are renting our private condo. We pay extra to the staff that is employed by the management company of the resort. If there are any unfortunate issues during your stay, you have the benefit of going to the front desk and having it addressed immediately. There is a private screened balcony overlooking a wooded conservation area. It is fully furnished with everything you will need for your stay. Includes equipped kitchen, dining area, TV in living room & all bedrooms, air conditioning, washer and dryer. Available on site is a large swimming pool complex with separate kiddie’s pool, hot tub, small (30 seats Approx.) cinema, a fitness centre, snack bar, restaurant, tavern bar, BBQ areas, picnic tables, WiFi and spa services. The resort is safe and secured in a gated complex with ample parking. A complimentary starter pack of toilet tissue, soap, shampoo, conditioner and garbage bag is provided on arrival to get you started. Grocery stores are plentiful and close by to stock up on everything else you may need. There are restaurants and stores located less than a mile away such as McDonalds, Chilli’s, Subway, Publix Grocery Store and Walgreen’s Drug store and much more. Details: · Sleeps up to 8 · Two queen beds, two twin beds & sofa bed · High-speed Internet access · Pet-friendly · Elevator access · Full refrigerator · Electric stove and oven · Microwave · Dishwasher · Iron & Ironing board · Coffee maker · Cutlery - Plates, cups & bowls · Saucepans and serving dishes · Toaster · Kettle · Dish Towel and wash towel · Starter dish soap · In-Room Safe Cost – $100-$125/Night Canadian Depending on Time of Year & duration of Stay. Plus a single charge of $175 Canadian per booking for Check-in, amenity, & cleaning 10% Deposit required at the time of booking. Deposit is non-refundable if cancelled within 2 weeks from stay. Remainder of balance required prior to the stay. Disney area Vacation Home for Rent!